Four weeks in to Veganuary and I’m still really enjoying the challenge. I had a bowl of my easy vegan honey almond granola with a banana and some almond yoghurt for breakfast this morning. It was so good. Once I got my head around it, I haven’t found vegan breakfasts difficult at all. This post for 31 healthy vegan breakfast recipes helped. For lunch I had some of this mushroom, walnut & butter bean pâté. It’s quite addictive and has really improved my packed lunch sandwiches. For supper we’ll be having a teriyaki rice bowl. I’ve made it twice this Veganuary and I’ll be blogging the recipe in the not too distant future. I haven’t missed cheese, eggs or milk chocolate at all. Who’d have thought it? Butter is the only thing that gives me a bit of a pang. I haven’t found an even half decent replacement for it. I’ve been eating a wider range of foods and cutting back on my sugar intake. I’ve discovered a few vegan tricks I didn’t know about and CT hasn’t complained once at having a vegan meal for supper every day this month. The Riverford vegan recipe box added an extra shot of interest and deliciousness. Riverford is probably best known for its organic farms and veg box deliveries. I get a fortnightly veg box and my mother was one of the very first to get a box when they first started up, way back in the nineties. As it happens, they do a lot more than grow and deliver organic vegetables. They have a bakery, a shop in Totnes, which sells all sorts of organic produce and two award winning restaurants where fresh organic vegetables are the stars of the show. I’ve eaten at Riverford Field Kitchen a couple of times and I’ve been wowed on both occasions. Riverford at the Duke of Cambridge in Islington, London is Britain’s only certified organic pub. CT can attest that the food there is mouth smackingly good. I’ve tried Riverford’s vegetarian recipe boxes a number of times and I’ve always been impressed. The idea is that you cook from scratch, but get provided with the exact ingredients you need. This takes out a whole level of hassle and makes the process simple and enjoyable. You can choose recipes from light (low calorie), simple (less than 30 minutes to prep and cook) and foodie (more involved). As just mentioned, all ingredients are provided, along with detailed instructions and photos of the finished dish. The ingredients are, of course, all organic. This was the first time I’ve had a Riverford vegan recipe box. I awaited its delivery with eager anticipation. I had two recipes to prepare. Each one made a substantial meal for two, plus there was enough leftover for me to have a modest lunch the following day. The photos you can see of the finished dish are both the leftovers that I used for my lunch. The portions are substantially bigger than these show. Riverford recipe boxes aren’t cheap, but they are of excellent quality. You know the vegetables are fresh and organic and the recipes will be interesting and delicious. My only quibble is the plastic. There’s not a huge amount, but there are little tubs of things like rice, vegan worcestershire sauce and spices. It’s a tricky problem for suppliers. They can’t have produce that spills out over everything else. I know Riverford is trying to reduce its use of plastic, so I’ll watch this space and hope they come up with a better medium. I thought the sweet potato gumbo recipe was going to be my favourite. I have a penchant for spicy food, so I knew I was going to like it. 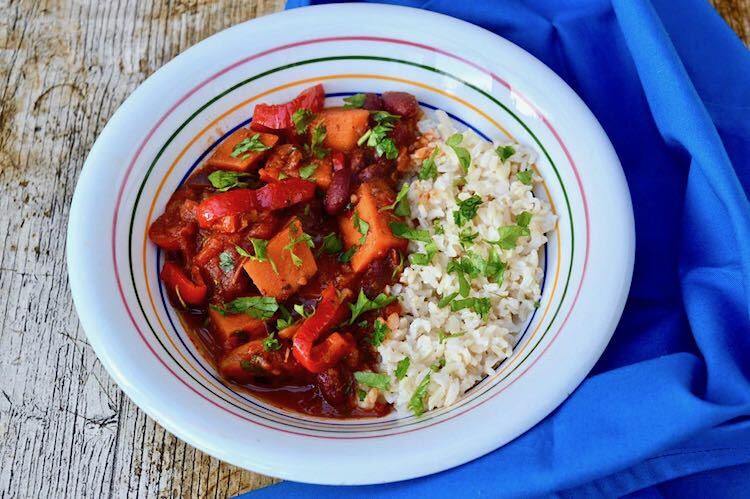 The sweet potato, red peppers, kidney beans and tomatoes made for a colourful and vibrant bowl. It was easy to prepare and it was delicious, but actually, it’s the sort of dish I often cook at home. There were a couple of ingredients I haven’t used before: red pesto and vegan worcestershire sauce. So, I’m by no means saying I was disappointed. The gumbo spices and cayenne pepper packed a wonderful punch and the whole thing was extremely moreish. If you don’t like things too hot, you could easily leave out the cayenne pepper or just add a pinch. When I first saw the recipe for the cauliflower spelt stew with crispy leeks, I have to confess I was a little crestfallen. It was billed as a “light” recipe, which always makes my heart sink. Oh ye of little faith! This was my favourite meal of the two. CT also voted it number one. It was quite different to the sort of spicy meals I often create, but really delicious. This is one of the reasons why I love Riverford recipe boxes. It’s almost inevitable you’ll make something you’d never have thought of. The meal was filling as well as super tasty and it had the added bonus of being under 500 calories per person. I picked up a really good tip with this recipe. Toast the pearled spelt before adding the water to it. So simple, but what a difference it makes. The scent of toasting spelt is, I found, quite intoxicating. I also discovered what a fab ingredient sweet white miso is. Miso has a permanent place in my store cupboard and I wouldn’t be without it. I use it mostly for miso soup, but often add it to other recipes too. But sweet white miso is quite different. Yes, it has umami notes, but it’s also fragrant and, as the name suggests, sweet (ish). The flavours in this recipe are really quite complex. As well as the miso, there’s mustard, garlic, lemon and thyme and they all have a role to play. The cauliflower is added to the spelt 10 minutes or so into the cooking process and finely shredded pointy cabbage added just at the end. 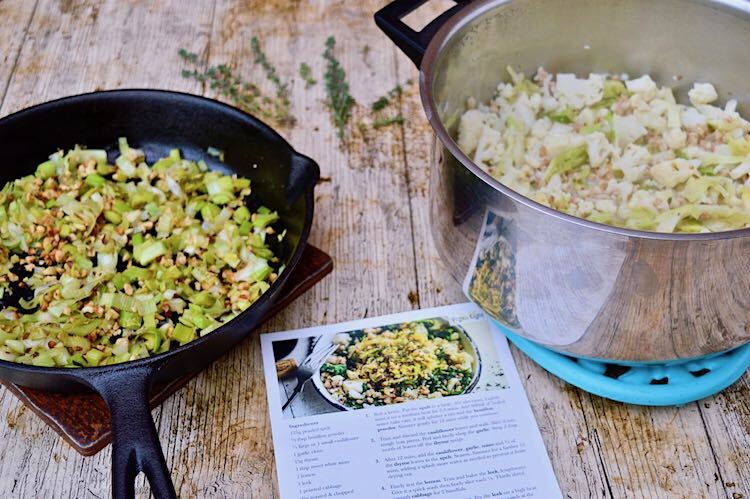 The whole thing is topped off with crispy leeks which are cooked with lemon zest, hazelnuts and thyme. Yum! To mark Veganuary, Riverford is offering one Tin and Thyme reader a Riverford vegan recipe box worth over £20. It consists of two recipes complete with ingredients and instructions. To be in with a chance of winning, please fill in the Gleam widget below. You’ll need to leave a comment on this post, answering the question, which then gives you additional chances to enter if you so wish. Gleam will pick a winner at random from the entries received. If you are commenting anonymously, please give me some way of identifying you as I will be verifying the validity of entries. Any automated entries will be disqualified. This giveaway is only open to those with a UK postal address. Winners will need to respond within 5 days of being contacted. Failure to do this may result in another winner being picked. I was sent a Riverford vegan recipe box to try. I was not expected to write a positive review and all opinions are, as always, my own. Thanks to my readers for supporting the brands and organisations that help to keep Tin and Thyme blithe and blogging. I have never tried Riverford before and am reducing my consumption of meat considerably. I drift between vegetarianism and veganish and need a little nudge to help me stay vegan. Riverford have nice quality products, too. I would love to try a Riverford vegan recipe box because I like trying new recipes and organic vegetables. 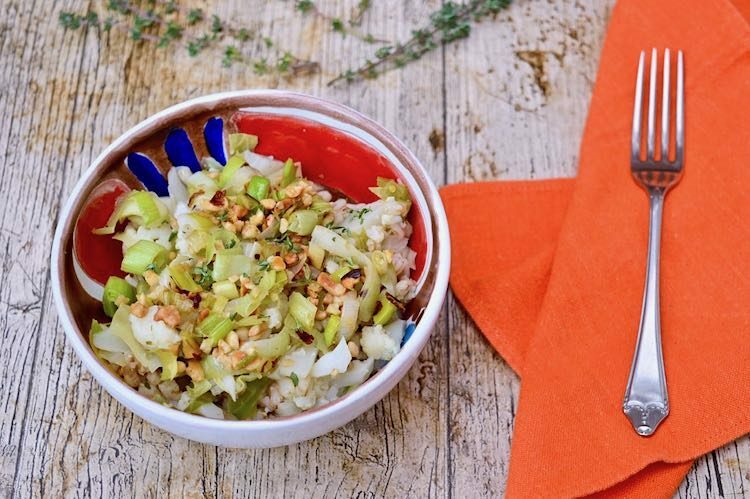 That Cauliflower Spelt Stew with Crispy Leeks sounds delicious and I’d love to discover a new favourite recipe for my repertoire just like that one! I would love to try a Riverford vegan recipe box because I have tried their veg boxes and I would welcome the convenience of a recipe box. I love trying new vegan dishes – and a Riverford recipe box sounds ideal. I am always looking to improve the healthiness of my diet. It would also be good to introduce some new flavours too to my somewhat bland diet. I’d like to try Riverford vegan box because the recipes look genuinely delicious and i’m trying to eat healthier. That gumbo looks really great! I’d love to try the Riverford vegan box. I got sold a Riverford box a few years back now after being assure the vegetarian box would be ok for a vegan. It wasn’t and I fedback that the ingredients in the vegetarian box whilst some were fine, others had to be left out of the recipe, making the box both wasteful and the recipe dull. They said that they agreed and that maybe one day they would have one. Well I guess with all the hype veganism has received in the past couple of years, they have finally seen the demand. This is so refreshing and as a long term vegan, it’s so surprising how accepted our lifestyle is finally becoming. But very, VERY welcome! Yes, things have thankfully moved on a lot. Being a vegetarian when I first became one wasn’t easy either and eating out was nigh on impossible – now it’s just normal. Hooray! I’d love to try it as the food looks amazing and I’ve also been doing a month of Veganism so this would help to inspire new ideas! It will make meal planning and preparing so much easier. I would like to try one of these boxes as I’ve started eating lots more Vegan meals and I’m loving the taste of them. I would love this box as it would encourage me and give me the confidence to take that step into veganism. I am vegetarian but have been putting off that step for too long. I’ve just put a toe in the water by taking part in Veganuary. It’s a good place to start. Would love to try Riverford as I have just ventured into the world of veganism. id love to try it as it gives you more ideas that you can make for yourself! I’d love to win because I’m trying to eat more fresh, vegan food this year and could really use some new ideas! I think the quality and freshness of the products would be amazing and would give great flavours on there own and combined with other dishes. I would like to try a veggie veg box so that I could make my husband eat a meal that does not have meat in it! I love the sound of having the exact ingredients not to mention the taking the hassle out of thinking what to have for dinner. I wan’t to find more vegetarian dishes that the whole family will love. I just love veg! I’m an omnivore but frequently cook and eat vegetarian or vegan meals, simply because they are so delicious. And I love getting a veg box, it always feels like Christmas when I unpack it. Haha, I know exactly what you mean Jane. I look forward to my fortnightly box with eager anticipation. I feel I am always cooking the same stuff and it’s getting quite boring. I would love to win the box to inspire me to cook something new. I would like to try some of the vegan recipes suggested. Sounds good as im at the age when i need to eat health and not what i seee on tv. I would love to win this as I turned vegan last year, so this would be just perfect for me, thanks. It would make trying a vegan lifestyle easier if all the vegetables were provided, especially if they were delivered to my door. I am always looking to improve new recipe flavours. I would love to try a Riverford vegan recipe box because I like trying new recipes. I’m always up for trying different food recipes so this would be fun to see what new recipes i can make with this box. I want us all to eat more healthily and it would be lovely to have an inspiring selection of veg turn up. It comes with all the ingredients on a recipe. Saves me the time of going out to look for ingredients. Often when I cook I just use what I have not following any set recipe. It would be interesting to see how it goes with everything at hand. I grew up near Riverford Farm but have never tried their veg boxes – I’d love to get more fresh food into my diet! I’ve gone vegan a couple of times, but have always relied heavily on convenience foods. I feel that this recipe box would be a good introduction to cooking cruelty free meals from scratch. New year, perfect time for new ideas! OH is a big meat eater & I like everything, so finding some tasty vegan meals that impress him may help reduce our meat consumption. I love the idea of veg boxes – would probably get me eating things I don’t normally buy instead of always picking up the same kinds of veg. That’s one of the reasons I like my veg box so much. I never quite know what I’m going to get. Recently new to Veganism and would love the opportunity to try and make dinner times easier! Yay, well done you. I’m going to try and have at least one day a week completely dairy free from now on. Vegan recipes are my favourite, and I am always looking for new ideas. I would imagine Riverford has only the freshest ingredients too. My son has been vegetarian for years and would like to go vegan but we need some ideas and recipes. I love trying new things, even better when they are vegan. Would love to try this. I have been experimenting with Vegan food for a while and there are some really lovely recipes out there. I’ve been vegetarian for most of my life, and as I’m lactose-intolerant most of my food is vegan. I’d be interested to try the box to discover some more plant-based recipes. This would be great to get some new meal ideas and some inspiration for my family. Vegan is new to us as a family so this would be fab! I am vegan and would love to try this box as a I love trying new vegan products. I think one of the problems I have is making sure I have everything in stock for a particular recipe (even if I go shopping to get the ingredients it can be hard because not all supermarkets stock everything I need). A recipe box solves this issue, so I would love to try one! The Riverford Vegan recipe box looks like it has great quality products and I love to try new things. We have never tried Riverford before and it looks a great way to learn some new meal recipes. I would love to try this as I love new ideas for dinner times. teenager just turned vegan, struggling to support this with my lack of knowledge, this would really help. I’ve heard good things about Riverford, but I’ve never tried their boxes. I’m trying to incorporate more plant-based meals into my diet, but often lack inspiration/suitable ingredients! This could be what I’ve been missing! I’ve been veggie for 30 years but I try to eat vegan as much as possible. I need to increase my repertoire of recipes, so this box would be great! I am a vegetarian who’d like to become a vegan. I’m trying to cut down on the amount of meat I eat so I’m looking for some recipe ideas and these sound great! I’ve been vegan for over a year and I make meals from scratch but am rarely happy with the outcome – they’re okay, but not as good as shop bought. Your review makes me keen to try Riverford recipes. I would love to try one of these recipe boxes as I love creating new things but always find that I’m a few ingredients short to make it. My son and I have turned vegetarian after following #Veganary and would like to learn a little more about being a vegan. I love trying new recipes and I feel like I need some vegan recipe inspiration to help me. I’m trying to go a lot more plant based and these sound like the perfect idea!! l want to start cooking from Scratch more so this would come in so handy! Good for a tasty meal for a meat free monday. We live in a vegetarian and vegan household and always looking for new ideas and recipes to try that is suitable for everyone to eat and Riverford sounds like a great selection to pick from. 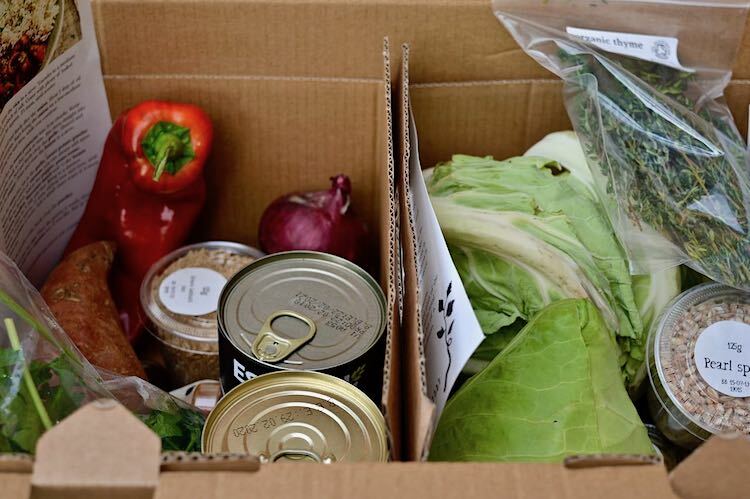 We are a vegetarian family and have a Riverford vegetable box delivery every fortnight and am intrigued by the vegan box and would love to see what it is like. Riverford recipe boxes are fun, though not cheap. Like you I get a veg box every fortnight, but the recipe box made a nice change and made the whole cooking dinner thing a whole lot easier as well as more interesting. I am trying to eat more healthily and substanably and this would be perfect to help me reach my goals. Im vegetarian struggling to transition to vegan . So this would be fab to win. I’d love this as I’m trying to get my kiddies to eat a lot healthier. My daughter is vegan, so I would like to cook for her and try some thing we can eat together. We would love this as my daughter in law is vegan and has changed our view. I would love to win as the whole family is trying to be healthier and happier, and this would be great to encourage that. I would love to try a Riverford vegan recipe box because i want to get more adventurous in the kitchen and start cooking my own meals. As a long time vegetarian, I’d love to win this to help widen our repertoire of dishes and help me take advantage of seasonal vegetables in a creative way! I would love to try some vegan recipes out. I keep wanting to try a vegan diet but wonder if it would be too restricted but I definitely want to cut down our meat intake and this would be a great first step. I would love to try one of these boxes to see how good they are! Because I am severely lacking in imagination and fairly time poor in terms of meal planning. Help! Would love to learn more vegan recipes and this is perfect!